With the support of the AMANAC Cluster, the BRIMEE and ECO-BINDER European Projects organised the Expert Workshop entitled “Bridging the gap between Research and Market Uptake: Innovative Energy Efficiency Building Solutions” dedicated to presenting a general overview of innovative solutions, technological opportunities and initiatives for building sustainability. The workshop took place in Milan, on the 23rd November 2016. 41 European experts from 10 different countries participated in the event. The event included a roadmapping session with the strategic goal to develop jointly a set of recommendations specifically targeting European stakeholders and policy makers in order to promote the market uptake of innovative products and services in the Construction and Building Sector. Business planning, marketing, communication and education. Experts were divided into groups based on the group number received during registration (from 1 to 4). Expert groups moved to the different posters, spending approximately 10 minutes at each of them. Each poster session was facilitated by a Poster Chair, from the Ecobinder and Brimee projects. 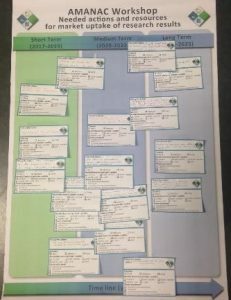 The posters included different columns for different timelines: short-term (2017-2019), medium-term (2020-2022) and long-term (2023-2025). Each expert had stickers (Figure 1) to be filled in and attached to posters. 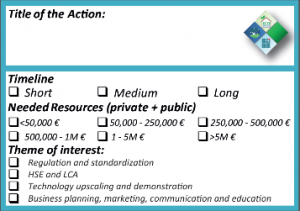 Stickers included the title of the action, the timeline (short-, medium- or long-term), the required resources, which were estimated for a single project in the range less than 50,000€ to over 5 Million€. Finally, the theme of the action was also displayed. The list of recent or ongoing EEB topics of the current H2020 Work Programme (2016-2017) was provided as background material, in order to get an overview of the actions already performed/planned and therefore avoid duplication. The brainstorming session ended with a wrap up plenary session: each Poster chair gave an overview of the stickers collected on his/her posters. Concluding remarks and next steps, including a provisional timeline for release of the Roadmap, were given at the end of the session. All posters were filled in with many stickers (77 in total): Figure 2 shows examples of resulting posters. 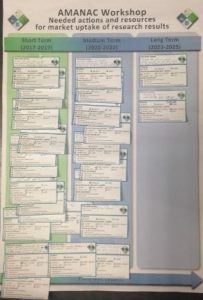 The recommendations were revised and clustered when needed, leading to the following tables which list the collected suggestions, grouped by topic and with details of timeline and required resources. Most of the suggestions are for short to medium term actions, aligned with the end of H2020 and the beginning of FP9 Framework Programmes. Even though the suggested actions are very diverse in terms of focus (some general and others on specific technical aspects), some key recommendations may be summarised for each area. Unified approaches considering many of the following aspects: LCA, LCCA, HSE parameters, Internet of Things aspects. Such approach should consider the whole value and supply chain, with a major focus on industrial factors. Monitoring tools and building management systems especially for retrofitted buildings and IEQ assessment. Technical solutions leading to high LCA and HSE improvements, for instance focusing on new IAQ technologies or CO2 storage and CO2 activated materials. New standards and certifications for: systems with limited validity time, building retrofitting (e.g. structural panels for facades, NZEB existing buildings, historical buildings), IAQ standards for emission labeling of materials. Upgrading and integration at a national level of the EU regulation and standardisation regarding IAQ, IEQ, energy and building management etc. Investment for upscaling, industrial production and commercialisation, with focus on long-term monitoring in demonstrators, data integration and management and mechanisation. Dissemination, communication and outreach, education and marketing in energy efficient building and selected topics such as use of natural/local resources, high efficiency storage, near zero energy buildings, indoor air and environmental quality. Mentoring networks and coordination and support actions for supporting SMEs and start-ups. Finding other financial opportunities for follow up/follow on of demonstration projects (potentially initiated by a restricted release of consortium business plan). The reported roadmapping exercise gave the opportunity to develop the described set of recommendations in a joint exercise with European stakeholders. The recommendations will be publicly disseminated through different channels, especially targeting European policy makers.